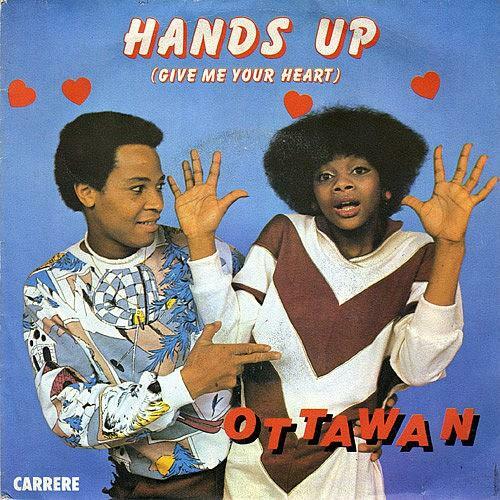 OTTAWAN "HANDS UP (GIVE ME YOUR HEART)"
I challenge anyone to remain motionless in their chair while listening to this one. This is such a feel good song, and it's guaranteed to bring a smile to the face of even the grumpiest person in the room - that's usually me! In the second half of the 1970s, it was the German pop group Boney M dominating the charts with their infectious disco pop melodies. The french pop duo Ottawan came relatively late on the scene, releasing their first single D.I.S.C.O. in 1979, which became a hit in 1980 in the UK, reaching #2. "Hands Up" entered the UK charts at #48 on 23rd August 1981. It soon became the duo's second top ten hit, reaching #3 on 20th Sept 1981 for two weeks in the UK singles chart. In New Zealand, "Hands Up" topped the charts for eight weeks. The single also reached #1 in Ireland and Norway, #2 in Germany and #3 in Austria. However, this was to be Ottawan's final major hit. Despite releasing ten singles between 1979 and 1982, they failed to have a succession of hits. The song was originally sung in French, and was adapted to the English version by the Belgian songwriter Nelly Byl. The B-side features an instrumental version of the A-side lasting for 3:02. 1981 was the dawn of the video age, and there is no official video for the song - not all artists at this time could afford to create a video. In our non-PC world back then, if an act couldn't perform in the studio of Top Of The Pops and didn't release a video, then a scantily-clad, female dance troupe performed a routine in time to the music. In 1981, it was Legs & Co. who took to the stage, and it was such a raunchy routine that it had to be censored for the more recent repeat showings on TOTP2 and BBC4. Apparently, one of the dancers showed way too much when she bent over - it was acceptable in the 80s! Ottawan was founded by Daniel Vangarde and Jean Kluger who also wrote and produced the duo's hit songs. They were also behind the hits of The Gibson Brothers, another French-based group with black singers. 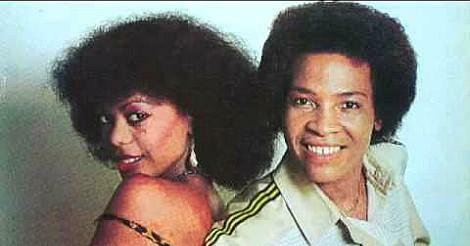 The two singers in Ottawan were Carribean-born Jean Patrick Baptiste and Annette Eltice. In 1988, Sway reached #7 in the Canadian charts with their cover versions. Spookily, Hype also reached #7 in Finland with their version of the song in 1995. They also reached #10 in Norway.